Whether flying solo or adventuring with a partner the wide base provides a comfortable sleeping space. Our tents can accommodate persons up to 6'2" tall. Two adults and one small child can lay in the tent comfortably. 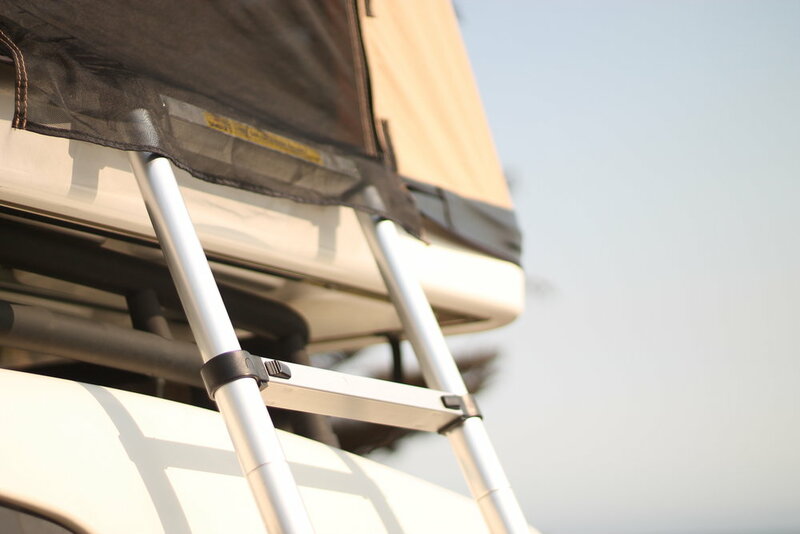 The quick release telescopic ladder hooks seamlessly to the inside of the tent base and can be attached to any side. Made of lightweight aluminum the ladder packs down to a compact size for transit. Ladder is extendable up to 8'. No one wants to get caught in the rain, especially when they are camping. The tent features coated and treated nylon ripstop fabric and YKK zippers which work together to provide a waterproof housing for all seasons. No tent poles. No stakes. No fuss. made for a go-anywhere up-for-anything kind of adventurer. What is a Pop Top Tent?